Generally speaking, a Non-Disclosure Agreement (or in industry jargon, an “NDA”) is intended to allow one or both of the parties to the agreement to be able to share sensitive business information with the other party who, in turn, agrees to keep such disclosed information confidential and not use it to the detriment of the disclosing party. NDAs are frequently used at the very beginning stages of discussions between parties to help them determine if continued discussions about a potential business relationship would be warranted. A potential buyer and seller are looking at whether the purchase and sale of certain assets, or potentially a merger or acquisition, might be mutually beneficial. An inventor approaches a manufacturer to determine whether the manufacturer is able to make a product for the inventor. A contractor contacts a specialty manufacturer to determine if the manufacturer is able to design and build a product for a specific application or project. A company that sells products contacts a manufacturer to obtain a quote on pricing for the manufacture of those products. Of course, there are an infinite number of situations where NDAs are used and the above are just a few examples. It is important to note that NDAs should generally only apply to information that is not already in the “public domain” and that the disclosure of such information could be detrimental to the party that owns the information. In other words, the information should not already be known in the market. Defined Scope and Definition. 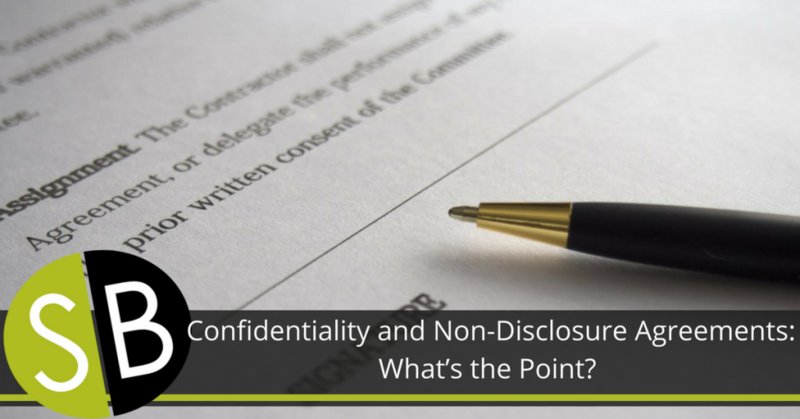 The agreement must define and describe the type of information that is “confidential.” Using vague terms like “general business practices” or “proprietary information” do not cut it, as such terms are so vague that they would be nearly impossible to enforce. Non-Use Clause. In addition to prohibiting the receiving party from disclosing the information to outside parties, the agreement should also contain a provision prohibiting the recipient from actually using the information outside of the business relationship with the disclosing party. For example, when a disclosing party provides detailed drawings and manufacturing methods to the recipient, the receiving party should be prohibited from using such information to simply manufacture the product itself. We have also seen situations where the recipient party used detailed information from a U.S. based manufacturer and had the products manufactured in China (utilizing the info provided by the U.S. based manufacturer). Duration. The agreement must contain a reasonable duration clause that limits the period of time that information is to remain confidential. While “trade secrets” are able to remain confidential so long as such information actually is a trade secret, other confidential information is typically limited to less than 5 years, with the vast majority of terms being 2 or 3 years. Return Clause. Should the discussions between parties ultimately break down and not result in a business relationship, either party should be obligated to return and/or destroy confidential information of the other party upon request. In certain industries, even requesting an NDA is considered taboo or even “amateur-ish.” For example, investors/venture-capitalists rarely, if ever, sign NDAs. The reason being that they look at many potential “deals” involving the same or similar concepts/ideas/technology/methodology, and they will not let themselves get boxed into a corner by not being able to invest in a project because it signed an NDA with a different entity on a similar project. Enforcing NDAs typically means litigation – which typically involves time, money and attention. In conclusion, while some parties view requesting or signing NDAs as a routine part of doing business, we suggest people give careful thought as to what they are actually agreeing to. While we do use the agreements on a regular basis, sometimes we also suggest to carefully time the release of sensitive information at the proper stage of discussions (after an NDA is signed) as the potential business transaction progresses. Parties should not feel obligated to disclose their “secret sauce” until such time as they are reasonably certain a transaction will or could take place, and even then, it should probably not occur until a more definitive, robust business agreement is signed by the parties.